So recently we looked at how Casey uses her laptop and realized that except for streaming music through iTunes, she does everything in a web browser. This meant that while a Macbook would be very nice, it’d also be a little overkill for daily use. Instead, it turned out that a netbook was a near perfect fit for her. 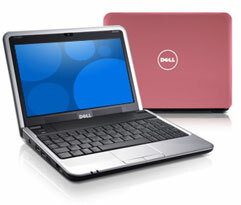 After reading reviews and searching for deals, we ended up buying a Inspiron Mini 9 notebook from Dell. Except for upgrading the color to Promise Pink, we opted for the base configuration (1 GB RAM, 4 GB solid state hard drive, Ubuntu Linux operating system). I immediately doubled the memory to 2 GB for just $20 and then, after being backorderd for a couple of months, installed a 16 GB RunCore SSD to replace the stock Dell hard drive. The Ubuntu operating system that came installed on the Mini is completely usable for most tasks, but my plan all along was to install Mac OS Leopard (10.5) to turn it into a very portable Mac laptop. There are a small number of netbooks that run Mac OS with few issues, and the Mini 9 currently tops the compatibility list. Armed with a very complete set of how-to instructions and a few free pieces of software, I had Leopard running on Casey’s Mini in a single evening. I did run into a couple of problems during the installation, but they were addressed in the instructions as known issues with workarounds and fixes. The end result? This is one fast laptop. Because there are no traditional hard disks spinning, it boots off the solid-state drive in just seconds and programs open almost instantly. There are tradeoffs, however. Because the Mini is so small, the screen and keyboard take some getting used to. Casey tells me that typing wasn’t a problem after a couple of days of practice, and I’ll take her word for it since I’ve only handled it sporadically. So, for about $350 and a few hours of work, Casey now has a netbook that is dramatically faster than her six year old PowerBook it replaced. Most importantly, it does just what she needs it to.